Another healthy bake which I absolutely loved , Almond and Oats cookies ,So far I have not blogged any baked goodies with Oats in it ,so last month during my shopping I intentionally picked a pack of oats and was looking for recipes and I landed here I just loved the recipe and without any second though I baked this cookies and enjoyed. Now lets get started. 1. In a blender powder the almonds and Oats, Add in the powdered almonds, Oats, Wheat flour in a mixing bowl. 2. To this add in honey, condensed milk and Vanilla essence mix everything to form a soft dough. 4. Roll the dough to form a shape of long and Cling wrap the dough and refrigerate for half an hour, next Slice the dough into equal sized pieces and arrange them in a lined Baking tray. 5. Preheat the oven at 180 Deg C for about 10 mins and then bake the cookies at 180 Deg C for about 13-15 mins or till the base of the cookies become brown. Allow the cookies to cool completely and the store in air tight containers. The cookies tends to become hard if over baked ,hence keep a check after 13 mins again the baking time may vary from oven to oven. Instead of Almond powder Almond meal can also be used for the cookies. This is such a healthy cookie can be had with coffee or tea. This is a part of Blogging Marathon #72. Posted under Kids delight Cakes and Cookies. 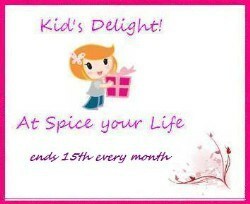 Kid's delight Cakes and Cookies hosted by Srividhya. Ah those cookies surely look amazing. Very nice ones to indulge in.. 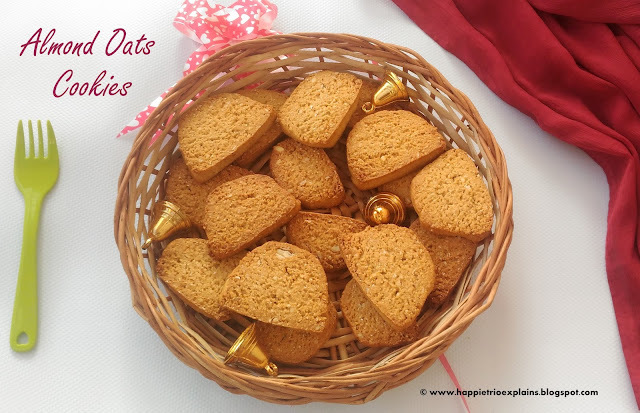 The cookies look wonderful , oats give a delicious flavour in cookies . 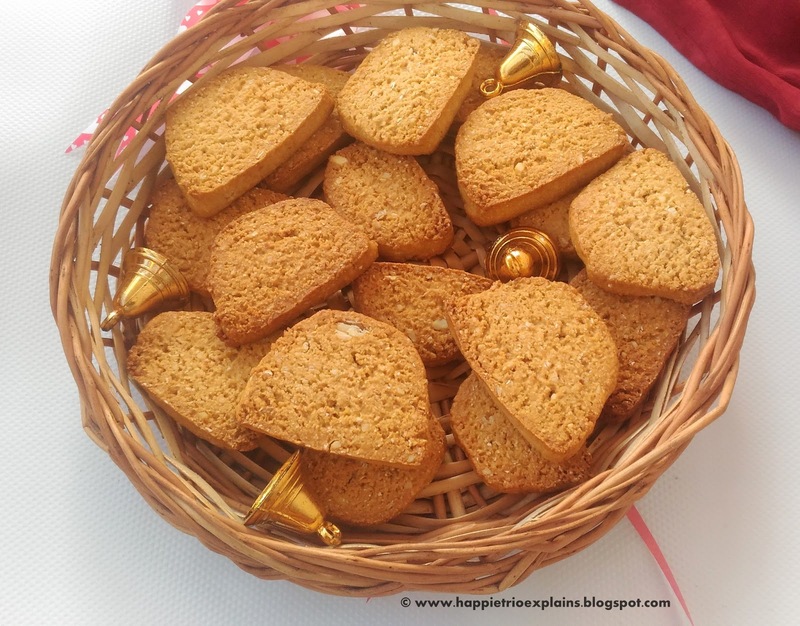 They look almost like biscotti. YUM! These cookies look so pretty. And I am sure they are absolutely delicious..
Not only healthy, its crazily tempting me. Looks yummy...Can't wait to try this!!! I like oats in bakes, specially cookies. 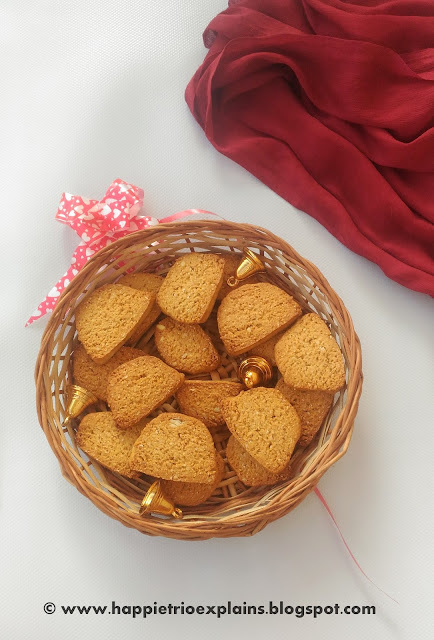 Almond oats cookies look amazing. Pretty cookies with oats. Bookmarking to make these soon. Nutritious and delicious cookies with oats. They look great. Feel like munching these ultimate cookies, scrumptious they are. Healthy and tasty looking cookies. No butter cookies?? Awesome bookmarked!! Totally reminds me of the bakery style cookies back in India. Beautiful texture of the cookies. These look so good. Great clicks. Hello - I tried this recipe. But the cookies turned out to be very hard, chewy but not crispy... Any reasons why? Thanks for writing Arati! !The prepared dough has to be soft while baking .If it is very hard it will stay hard even after baking .so please add some more milk and make it a soft dough and then try ,It would turn out perfect!! Crispy, crunchy cookies!!! Perfect snack with our evening tea and a great gift to friends too!! Instead of condensed milk, can regular milk be used? Texture of condensed milk and regular milk is totally different ,so it cannot be replaced! !